Although there are many Twitter apps for Android, the majority of them all focus simply on: streaming tweets, providing access to your Twitter lists, and providing alerts when mentions and direct messages come up Within the Android landscape. The official Twitter app, and Tweet Deck (also owned by Twitter) currently hold the high ground in terms of Twitter market share. 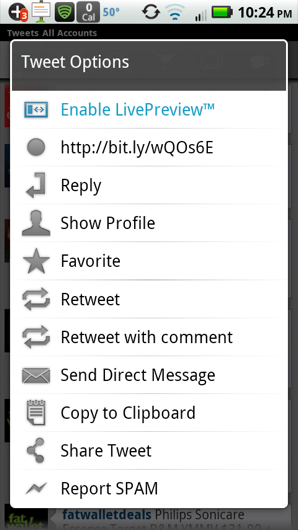 However, for power users, and those looking for an app which takes innovation to the next level, UberSocial (formerly known as Twidroid) provides many features crucial for a Twitter client, while also tossing in a few outside the box features which help to make Ãœbersocial a well rounded app for beginners, to advanced Twitter users. The areas Ubersocial stands out from the crowd are in its: clean interface, fast performance, helpful notification preferences, and clear outlines of read and unread tweets. Additionally, some unique features are: daily deals integration from Living Social and Groupon, a live preview pane for tweets with links to websites, simplified user stats, a panel to search for Tweets specifically around a specified location, and channels from media outlets to let you see top news without needing to sift through fluff. While reviewing Ubersocial, the one feature that immediately sold me was the “live preview” pane which allows users to select any tweet with a link and view that webpage live, alongside the original tweet. When holding your phone in portrait mode, the website appears below the tweet details, however when holding your device in landscape mode, Ubersocial moves the tweet to the side, allowing the interface to better utilize the space. Additionally, the preview pane supports Flash and browser capabilities meaning that if the link contains video or audio it should be playable. This feature is unique to Ubersocial as of the writing of this article, and as such is a killer feature which gives Ubersocial a major advantage over competing Twitter clients. On top of being able to view web pages in app, Ubersocial provides users with a robust profile interface which allows members to view: followers, following, tweet and list content all from a simple panel, accessible by pressing the user name which appears whenever you select an individual tweet. When viewing the lists of followers, users the person follows, or lists â€“ Ubersocial uses the same live preview capability so youâ€™re able to keep the original users bio in view while scrolling through the lists. 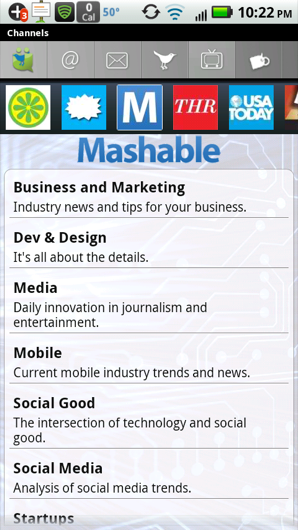 Additionally if anything catches your eye, a simple tap allows you to view more details about the selected information. For users who simply care for using Twitter as a way to view the top news, Ubersocial has a Channels feature which allows you to view a list of trending news topics based on outlet – some key curators are Mashable, USA Today, The Holywood Reporter, and many others â€“ and then being able to view only the most relevant Tweets from users. Rather than limiting the pane to showing reporters from the outlets, Ubersocial lists the most relevant tweets around a topic allowing you to better filter through the typical flood of tweets and allow you to find the insightful tweets. For users who enjoy interacting with others, this feature also allows you to find tweets that matter most to you, which are easier to reply to. Although Ubersocial is heavily associated with accessing your Twitter account more efficiently, it provides users with the ability to have many of the deals from the top daily deal sites displayed neatly in their own pane, called the DealBox. For the most part it appears that the feature only supports Groupon and Living Social for now, but overall it’s well implemented. By allowing for real-time GPS updating, you can even have the deals changed based on your location although the app also supports setting specific locations manually if desired. 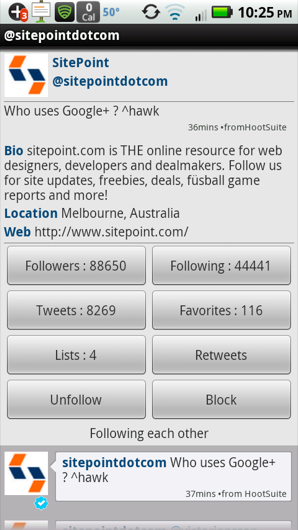 Overall, Ubertwitter is a great app and is a must have for any Twitter user. 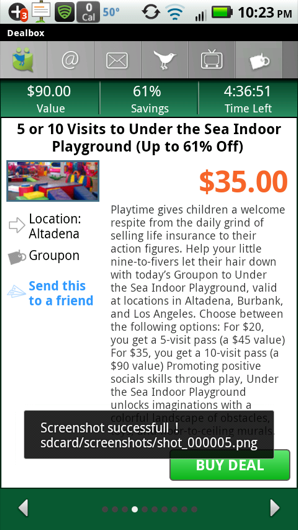 While I personally found the DealBox feature to be a bit redundant as I already had the Groupon and LivingSocial apps already installed on my phone so I can redeem deals without paper vouchers, the feature did not take away from the focus on Twitter and also can be hidden by customizing the layout. By packing the tools for a power user in an interface as sleek as the Twitter website, Ubersocial has managed to create a well rounded app for any Twitter user.